A fairly ordinary-looking galaxy has been hiding a strange secret in plain sight. It is ten times larger than anyone thought (a whopping 718,000 light years in diameter), plus it’s younger on the inside than it is on the out. Scientists think that it’s been stitched together from the pieces of several other galaxies — hence its nickname, the “Frankenstein galaxy”. Under ordinary, optical light, Galaxy UGC 1382 looks smaller and fairly ordinary. In fact, the galaxy had been included in over 40 different papers before this discovery, and none of them had catalogued it as unusual. Then astronomers decided to take a closer look in the ultraviolet regime as part of a different survey, and the strange features of the galaxy began to shine through. Furthermore, for almost all known galaxies, the outside edges are younger than the inside. That’s because galaxies form from the centre, and expand outwards with newer, younger stars. 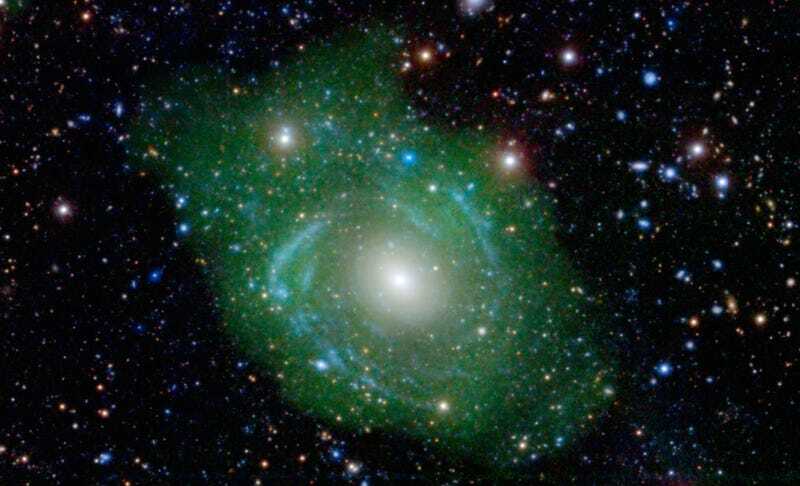 But for UGC 1382, the galaxy’s centre was younger than its outside. For Galaxy UGC 1382 to form as it did — to essentially merge, leaving whole parts of the galaxies relatively intact — everything had to occur exactly as it did. Even slight changes would have been enough to dramatically change the course. “If they were galaxies of equivalent size, that would be a crash and that would have been disastrous,” Seibert said. “Large galaxies don’t come together like this, it’s a medium sized galaxy and some little ones”. The unexpected size of the galaxy raises questions over just what else we’re missing out there. Although the researchers believe the strange features of Galaxy UGC 1382 are very rare, there are other faint objects that could have their own secrets hidden.